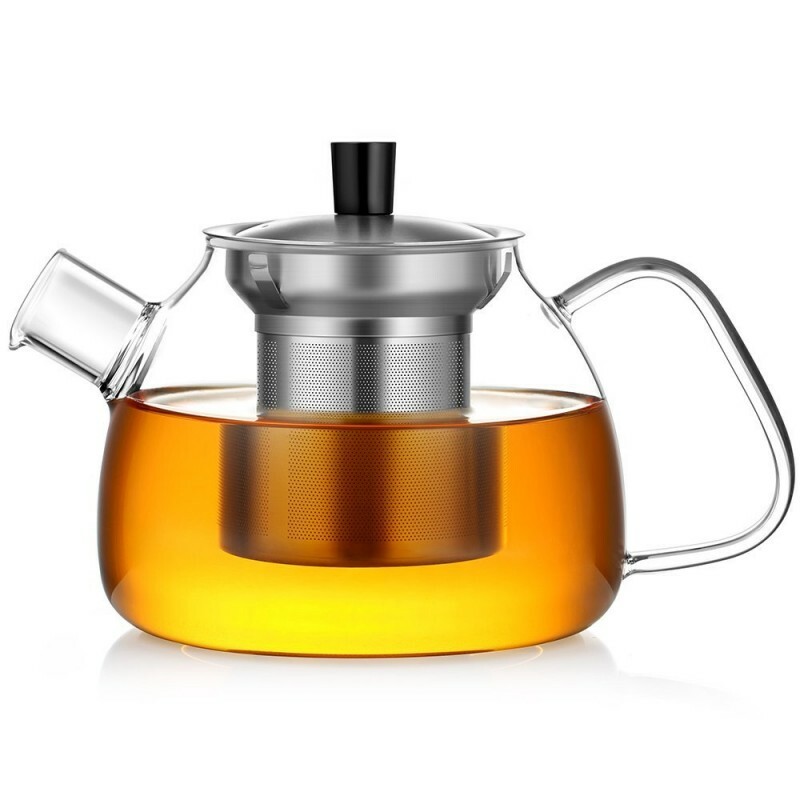 Borosilicate glass teapot is stovetop friendly for gas, electric ceramic stove and more — perfect for tea brewing. 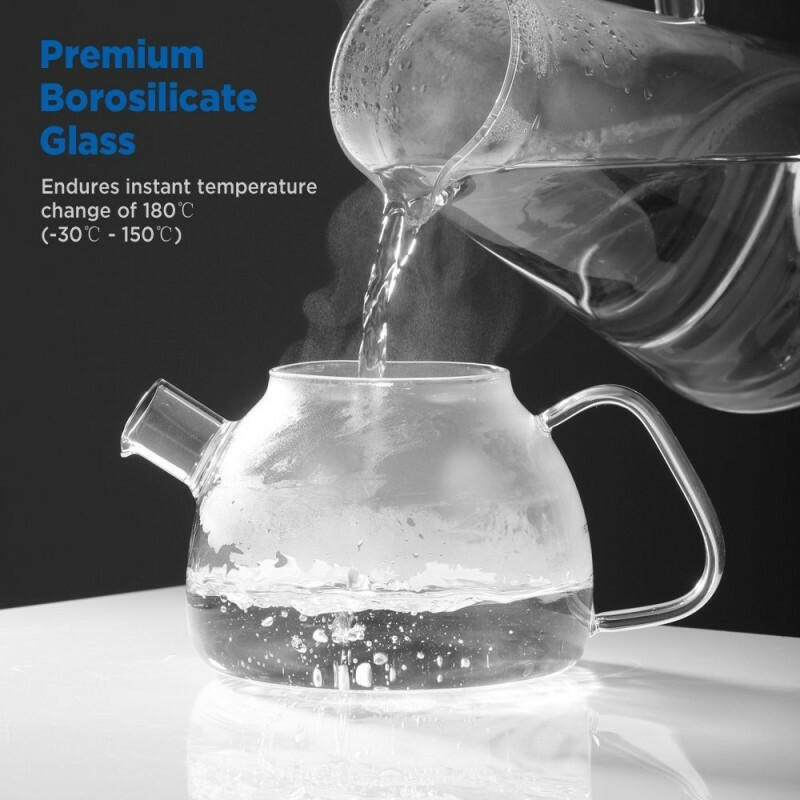 The glass teapot can handle instant temperature change from -30 ℃ to 150℃. 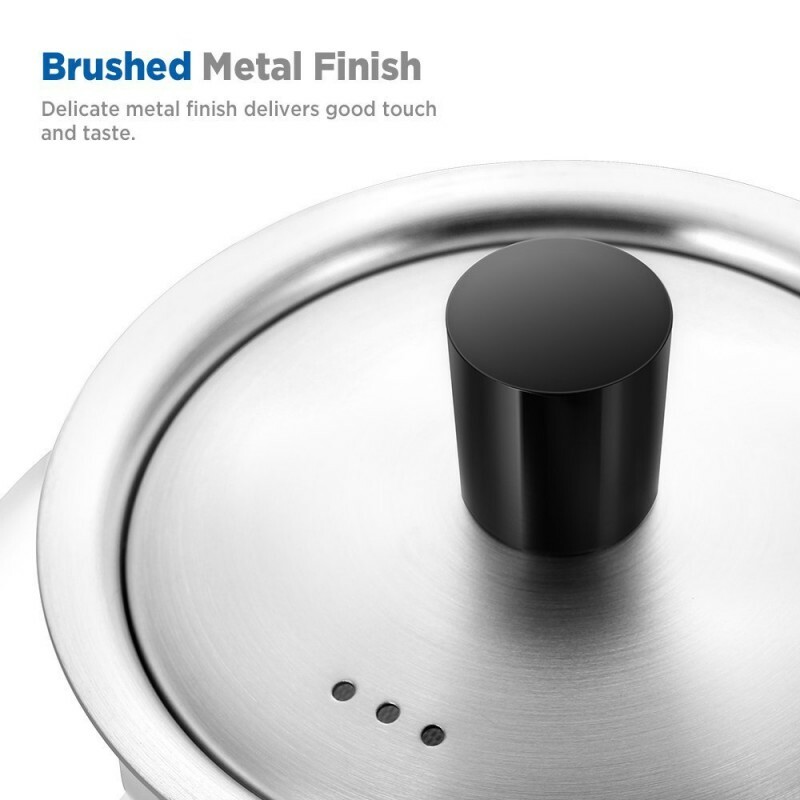 It allows you to fill boiling water into the frozen teapot instantly. 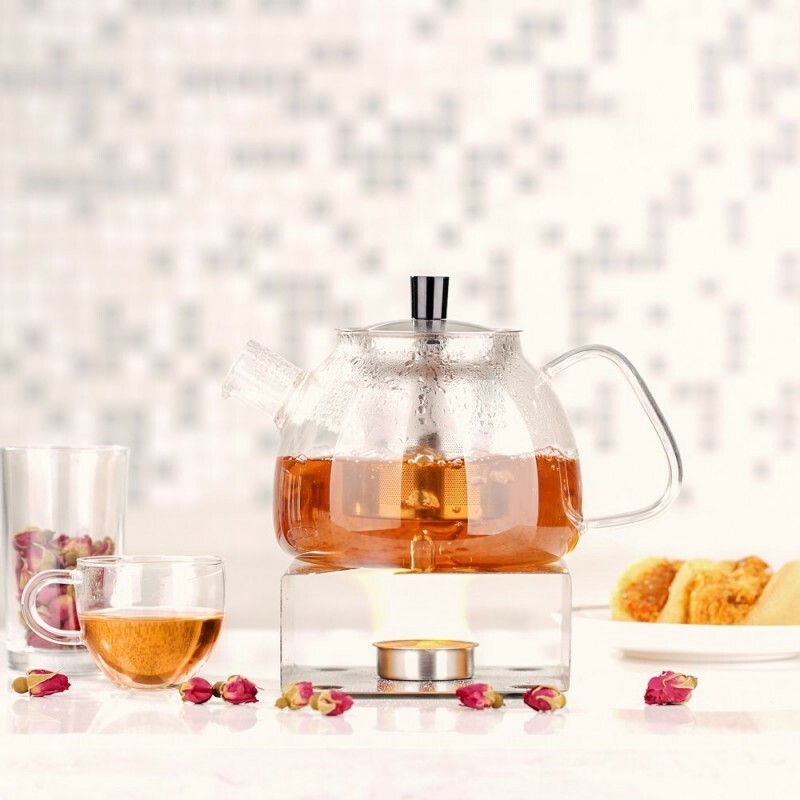 The handle of the glass teapot is made wide and solid for a pleasant grip. 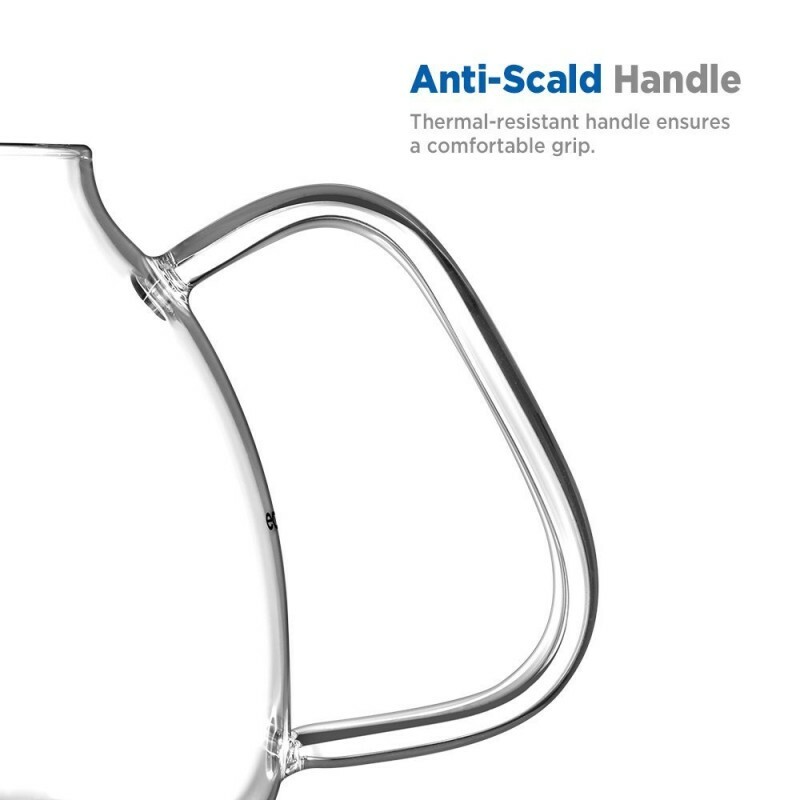 While the thermal-resistance property makes the handle never too hot to hold, though with boiling water. Not only a great quality product that we own 3 of, but the company has an outstanding service. Cracked within two months. Update: First of all I want to commend the customer service I received . Just like it is mentioned the description they are truly friendly. I was sent a new pot after my first was cracked (though I'm still not sure why that even happened). Anyways the update is for the professionalism and great customer service I received :). I will update again in a few months but so far the pot is functioning well ( I'm being extra careful too, washing by hand and storing safely). So I decided to improve the rating from 2 stars to 4. Second, I love that I can add my spices ( cinnamon and cardamom in my tea and no need for a separate strainer. This pot is a really good alternative for that. Exceeded my expectations. The build quality on this is fantastic. I feel like its a steal at 17 bucks! Under $20? Can't go wrong. My wife and I have been looking for a quality STOVETOP kettle that was a little better than the old kettles we had when we were children. We found there was a good selection of electric kettles (countertop), but not really a good selection of quality kettles that were made for stove top use. We were both surprised to learn that this GLASS teapot/kettle can withstand instant temperature changes. Not that we would ever need to pour boiling water into a super cold (GLASS!) kettle, but...you CAN! I almost want to try it...but better not. The addition of a stainless steel filter was a nice touch. We like to use a variety of different teas and herbal drinks, it's not pleasant to find a floating (something) when you take your first sip. It's also completely wash-able, so any particulates the Stainless Steel filter catches can be rinsed out easily. Bringing back the old kettles we used to use - we don't need a gallon of hot water! This (2017 version of a tea pot) holds enough water for 2-3 people. It's just the right size, if one of you has a bigger cup, it has just the little extra water you need - but no waste! I had a few questions about the kettle that were answered quickly and effectively. I feel that if I have any further questions I will be taken care of. All in all a nice modern tea pot that should last my wife and I a long time. Oh, under $20? Can't go wrong really. I wanted a small kettle that was easy to clean, and this kettle was a perfect fit. My only concern was that the glass is rather delicate. I use it every day, and months after buying it, it slipped while I was setting it in the drying rack and shattered in the sink. I emailed the manufacturer, explaining what had happened (clearly my fault), and they sent me a new one free of charge. Thanks Ecooe! incredibly small, yet sturdy.. i guess when you buy a near 1 litre kettle, you get it! Smaller than I imagined, but does hold 3 cups of tea. I love this thing! It is rather small looking but fits several cups of water. The handle does get hot if place on a burner larger than the pot itself and the heat is directly under the handle. If heat is not directly under the handle you can touch it and it's warm but you can hold. I happened to have a newborn and we use it to boil water for her during the day so that we can use for her bottles. It looks nice on the stove, it's easy to clean. It's perfect for a nice cup of tea. When I'm out of loose leaf I use tea bags. I'm ordering a second one for my grandma! I recently purchased this little pot and have been very happy with it thus far. It is immaculately designed and comes packaged in an equally well designed box that was a small joy to see given the sort of slap-dash packaging that you see for a lot of other things. It works very well on my gas range and in the microwave as well. The infuser also works very well and makes a great pot of tea. Cleaning it is quick and easy. I wash it by hand, though, as I'm afraid that the handle might be a bit delicate for the dishwasher. 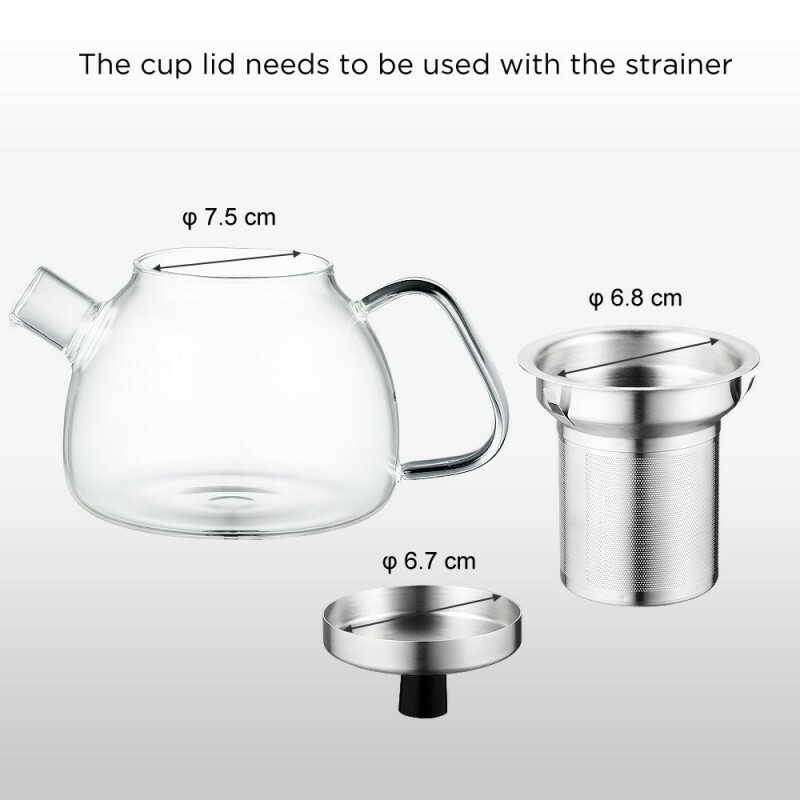 The only thing I wish, and the reason for the 1/2 star demotion, is that I wish if came with a glass lid for those times when you might want to use it for some other purpose than to brew tea. I hope the manufacturer would consider that for the future. Other than that small detail, I am enjoying it quite a bit and would easily recommend it to anyone who is in the market. Very cute teapot and I loved the idea that you can put tea leaves in it. However, a little on the small side and the glass is very very fragile. Mine broke while I was washing it. Thanks to amazon for issuing me a credit for it! Makes 2 good size cups of tea. Tea sacks make it easier to clean when using loose tea. I like the pot a lot. It is easy to clean, brews tea quickly and is easy to see when the tea is the right strength. The pot holds 2 generous cups but no more. My only complaint is that the top is plastic and melted easily. I jimmied it so I can still use it, but you would think that it would have been made of a more heat-resistant plastic since it is the top of a stovetop pot. I love this kettle it's so adorable and perfect. I am the only one that likes hot tea in my household so it's perfect for just one person. It gives me a couple of glasses a pot. I got this for home and a smaller one for the office. I use it daily for green tea. Perfect - couldn't think of any way to improve it. Pyrex, so won't shatter from temperature extremes. 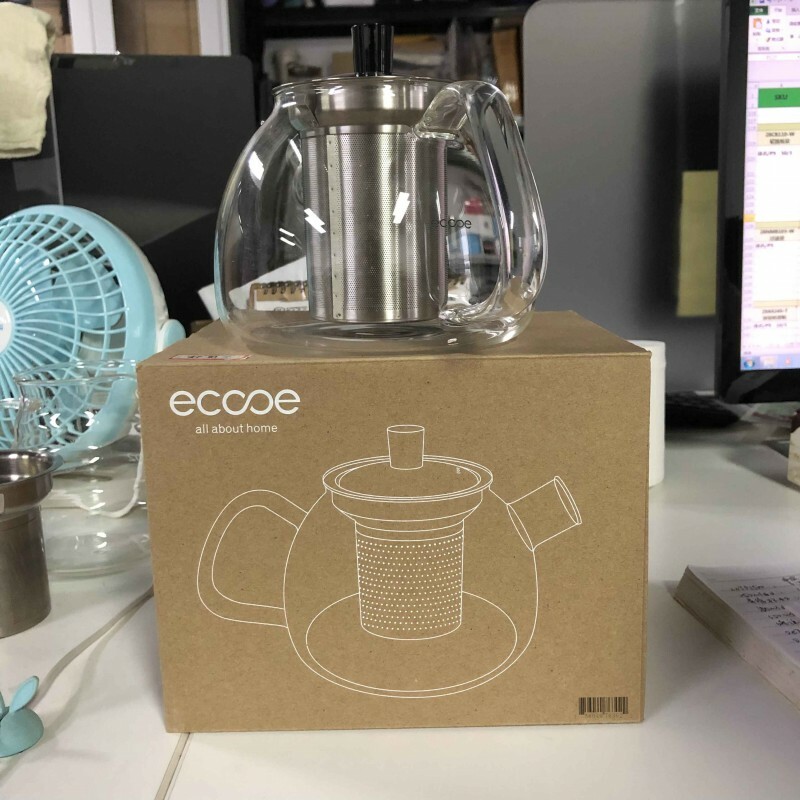 Smaller than What I was expected ..
the bad thing is you can not use this without the strainer .. lid doesn't fit on the pot without the strainer .. strainer is made of quality stainless steel. it works great on glass cook-top.. Please read the UPDATE below (they sent me a replacement after this was written). I was very excited about this product---and it worked well for a few months. Despite normal usage, however, it has cracked in a few places. I used it regularly, but always within the guidelines for the product. This teapot is beautiful, and I really enjoyed using it---but it didn't hold up. Don't let the aesthetic quality and ease of use convince you that this product will last. Choose a better, sturdier product. UPDATE: After my review I contacted Ecooe's customer support. They sent me a replacement, without any hassle. They demonstrated great customer service. I'm hopeful my new product doesn't have any problems--and that I can update this to five stars after the product demonstrates it's hardiness. This is a beautiful product that I enjoy using. I hope the durability issues with the first one were limited to that product. Give them a shot--because if there is a problem their customer service is excellent and they sent me a replacement---without any hassle. I love this little tea kettle. The glass is pretty thin and overall it is pretty light but it works great and it's stylish. You can get 1 to 2 glasses of tea in this little kettle. © Copyright © 2017 - ECOOE.COM - All rights reserved.